The housing production crisis has fully gripped the state, marked by a severe lack of price-attainable homes and apartments and a drastic increase in homelessness. 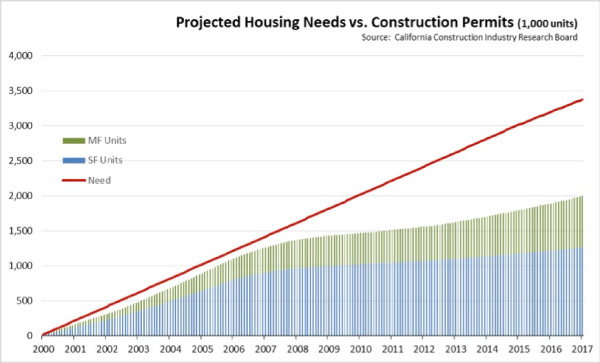 For far too long, we have not built enough homes to meet our state’s housing demand. As you can see in the graphic below, the housing supply deficit in our region has grown at an astounding rate in the last ten years with no signs of slowing down. Unless we dramatically begin to build new housing at the levels necessary to both make up for past deficits and keep up with population growth, housing prices and homelessness rates will continue to rise, exacerbating current problems. THE MISSING MIDDLE – Locally, the worst housing supply crisis is for workforce housing. Despite a Regional Housing Needs Assessment (RHNA) projected need of 13,728 moderate-income units; the City of Los Angeles has only permitted 275 units since 2013 ( 1 ). The situation in the County was even more severe with not one single moderate-income unit permitted ( 2 ). Public subsidies are insufficient for lower-income households; however, they are nearly non-existent for middle-income households. At the same time, development is too difficult and too costly for workforce housing projects to be feasible. Therefore, middle-income households don’t qualify for below-market rate housing units and are left to scavenge for more and more expensive market-rate housing, along with most low-income households that can’t find subsidized housing. By producing more naturally-occurring workforce housing, the market would naturally lessen the burden on both lower and moderate-income families. Like Southern California, Seattle’s unprecedented population growth and a soaring economy has driven housing prices skyward within the past decade. However, a steady supply of new housing units in some of Seattle’s most desirable communities has helped prices to finally stabilize ( 3 ). Rents have dipped 2.9% in the last quarter, amounting to between $50-100 per month savings for the average renter ( 4 ). The supply of housing is finally outpacing the number of new renters, giving the market some much-needed relief ( 5 ). Taking cues from Seattle, we must begin to remove the supply restraints in our region and increase inventory to bring about true housing affordability. This paper discusses the following root causes of the housing production crisis and puts forth several key solutions that can be implemented at the state, regional, and local levels. This action plan takes a closer look at some of the forces behind our region’s exorbitant housing prices, followed by practical and effective solutions that can help increase housing supply at every income level, thereby driving down costs. Although the greater Southern California region is notorious for its sprawling-built environment, in the past decade, we have grown into one of the densest urban centers in the country. Our region is slowly shifting away from its auto-dependent sprawling reputation toward more transit and density. However, as the building industry moves to meet our population’s housing needs, the lack of available land for residential development has stymied efforts, increased time and uncertainty through a multitude of zone and plan amendment changes, thereby inflating costs. Many more of us are now appreciating and embracing high- density living and the substantial benefits that come with that – a walkable community, and transit-rich options. High-density housing can bring down housing costs, reduce environmental impacts, and increase supply to better serve all income levels. However, General Plans, municipal zoning codes and community plans must also be updated to increase the shovel-ready residential land supply to support these housing options. Additionally, affordable housing competes against market-rate development for land opportunities, pushing the affordable housing to low-opportunity sites. Only by increasing the amount of residentially-zoned land would affordable housing developers be able to compete in ever-tightening markets. Support state legislation that will increase height/density near transit and increase housing production. Facilitate and encourage 100% by-right residential development in commercial and under-utilized industrial zones. Extend density bonus increases to developments that include workforce housing components. Encourage public/private partnerships to develop under-utilized public land for housing. Allow ADUs to count as below market rate unit. Support state legislation, such as AB 2553, establishing a tax abatement program for multifamily residential development, allowing dollars to flow back into the project to finance increased density. The speed at which project approvals are granted is strongly linked with the costs of development, and ultimately, housing affordability. The ever-increasing number of substantive requirements has increased the length of the approval process. To begin chipping away at a housing deficit in the hundreds of thousands ( 6 ), we must look at tangible ways to quickly bring this number down. Create a dedicated housing unit within each planning department responsible for reviewing, processing, and expediting approvals for housing projects. Allow developers to fund planning staff positions whose sole assignment is to shepherd and expedite planning approvals for that developer’s specific project. Give priority treatment to development projects that contain not only affordable but also workforce housing components. Streamline the development process to reduce the total time necessary to obtain a Certificate of Occupancy. This includes keeping utility companies accountable to a deadline by setting clear turnaround times, despite inadequate staffing. Municipalities should establish Parallel Design-Permitting Program (PDPP) similar to City of LA and allow housing projects with no commercial space to enroll in the PDPP program. Ensure more accountability by publishing performance metrics and actual review times of steps in the permitting process. Enact state legislation that requires local municipalities to follow concrete turnaround times for critical junctures in the development process. For example, it could mandate that cities must approve/deny building permits for market rate projects in 120 days and 90 days for affordable housing projects. Strengthen existing housing laws like the Housing Accountability Act and the Permit Streamlining Act. Extend California Environmental Quality Act (CEQA) exemptions previously set-aside for high-profile development projects, such as sports stadiums, to qualified housing projects. Support CEQA reform at the state and local levels by updating guidelines for thresholds of significance and implement all applicable statutory and categorical exemptions. Support bills that discourage duplicative CEQA lawsuits, never-ending appeals, and increase the speed of housing production without compromising the quality of environmental review, such as SB 1340 and SB 1341 (2018). Put simply, high building costs lead to higher prices for the consumer. This hurts low- and moderate-income households the most. Regulatory Costs: Steep government fees are one of the most significant barriers to new housing starts as it can drive home costs beyond the reach of the typical household. According to a housing cost study in San Diego County, approximately 40% of the cost of housing across various price segments is the result of government regulation ( 7 ). Enact state legislation requiring local municipalities to publicize complete fee schedules on their website and update them every year to provide for more certainty during the project underwriting process. Prohibit new exactions once a development application has been submitted. Support a total cap on impact fees. Defer the payment of impact fees until the receipt of the Certificate of Occupancy. Construction & Labor Costs: Prevailing wage requirements and rising raw materials costs add even more pressure on ever-thinning margins leading to fewer projects being built. According to a recent study, prevailing wage mandates would increase the cost of a new home by $84,000 ( 8 ) statewide and increase the average monthly rent by $460 per unit in multifamily developments ( 9 ). This hurts the working poor the most, forcing 481,000 people into poverty and cost another 372,700 their jobs – pushing even more into homelessness ( 10 ). Prevent prevailing wage mandates for all housing projects to dramatically reduce construction costs and increase housing production. 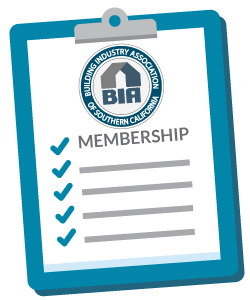 Examine the use of alternative building materials and methods, such as modular housing and other prefabrication technology, which could deliver housing to market faster and more cost-effectively. Encourage the State to offer tax incentives to encourage the modular construction industry, and set targets for a certain percentage of homes funded with LIHTC or state dollars to be built with modular construction. Establish strong accountability measures for use of public funds. The system of financing affordable housing development has been created almost perversely to make affordable housing developments almost as expensive as possible – as the funds come with government special requests and regulations. Planners and public housing department funders have been known to heap on extra conditions which add additional cost, such as adding a component of retail space to which oftentimes never finds a tenant; heaping on requirements that soar well above code requirements, such as LEED requirements or Energy Star for Homes requirements, accessibility upgrades beyond the needs of the general population, prevailing wages, PLAs, local hire, balconies, community rooms, playgrounds, community herb gardens, fitness centers, courtyards, art projects and so on. Suddenly a project that might cost $260,000 per unit to build mushrooms to a cost of $550,000 per unit. Our case study in Appendix A extrapolates an instance where costs became too high to bear and the below-market rate housing project was abandoned. Government should allow for more flexibility in unit size and design of affordable units to reduce the amount of government funding needed. Affordable housing funds and regulations should be focused strictly on trying to obtain as many below market rate units as possible. Homeless developments should be focused on trying to bring as many people into housing as possible – vs. LEED Platinum certified units built with prevailing wages under a PLA agreement. Support the $4 billion state bond on the 2018 ballot that would fund low-income developments and subsidize home loans for California veterans. Establish by resolution, ordinance, or legislation that a certain percentage of public dollars will be automatically deposited into a fund only to be used for affordable housing development. Increase the local real estate transfer tax for real estate transactions greater than $2 million and dedicate the additional funds into an affordable housing “lockbox” which cannot be poached. Re-establish a redevelopment mechanism that can use tax-increment financing districts to give local governments a reliable financing mechanism to invest in economically-distressed communities. Earmark state budget surplus funds for qualified affordable housing projects. Bolster first-time homeownership programs and access to fair, low-cost financial services to provide more paths toward economic mobility to middle- and low-income households. The Redevelopment Property Tax Trust Fund Distributions, a.k.a. Boomerang funds, should be allocated to fund the production of affordable housing. Earlier this year, the California Department of Housing and Community Development announced that 97.6% of all cities and counties in California failed to approve the housing needed – both market rate and affordable – to keep pace with population growth. The repeated failure of local governments to meet their Regional Housing Needs Assessment (RHNA) numbers, and the lack of any penalty for not meeting those goals, is one of the main root causes of our housing crisis. To create more transparency and accountability, all jurisdictions should be required to provide and publicize on their websites a monthly measure of (a) units applied; (b) units approved; (c) permits issued; (d) Certificates of Occupancy issued; (e) units demolished; and (f) actual housing units created. Adopt a less restrictive version of recently adopted SB 35 (The Housing Accountability and Affordability Act) at the local level by including single-family home developments and removing height restrictions. Support measures such as SB 828 (2018) that would create a more equitable process for how regional bodies assign RHNA numbers, and gives it more “teeth” by requiring cities to begin making up for past RHNA deficits. Amend the State’s Housing Element law to (1) require that only feasible and realistic development projects can be included within a city’s Housing Element plan; and (2) increase the online publication of RHNA progress reports from once a year to twice a year with strict penalties for failure to do so. Continue to support state legislation that removes local control if cities fail to meet state-mandated housing goals. Besides a complex financing structure, a long and uncertain entitlement process, and high input costs, another challenge in getting new homes built–regardless of income level–is a general resistance to new housing projects by the local community. This is often caused by a lack of accurate information, the spread of misinformation, misconceptions about who benefits from more housing, and the tendency for a vocal minority in the community to control the housing discourse. To rally more support for housing, we must communicate with and hear back from the solid majority of residents who would say ‘yes’ to more quality homes in their neighborhood. Work with the state and local government agencies to develop a public education/outreach campaign that increases understanding about housing issues and stresses the positive impact that it brings to individuals, families, and the community at-large. A model example is Houston’s housing campaign entitled “Can I Be Your Neighbor Too?” Organize public forums on housing (outside of contested public hearings) to disperse information and promote communication and awareness about the housing problems in our area and how individual communities can do their part. Not many of us can remember a time when Southern California has not been in the throes of a housing crunch. For decades, local officials have implemented well-intentioned policies aimed at alleviating the housing shortage. These policies have been detrimental to housing production, doing more harm than good. We should not pursue worthy goals to rehouse the homeless and increase the number of permanent supportive and subsidized housing units at the expense of the rest of the housing market. Inclusionary Zoning: Many cities have looked to inclusionary zoning to require the private sector to create much-needed affordable units. However, as we can see in Portland, the adoption of an inclusionary zoning policy has caused housing construction to fall off a cliff. Since the policy went into effect on February 1, 2017, only 17 projects with 654 units have filed for permits ( 11 ). Compared to a yearly average of approximately 5,000 units, it is clear that the uncertainty and cost of Portland’s inclusionary zoning policy is having a profound negative impact on their housing market ( 12 ). Linkage Fees: Touted by many policymakers as an alternative to inclusionary zoning, linkage fees are becoming an increasingly popular response to the housing affordability squeeze. However, like many inclusionary zoning policies, exactions that are set too high will be counterproductive and stall new construction while raising the cost of new market rate units. Last year, the City of Denver levied a new linkage fee on residential development that was expected to generate $150 million over the course of 10 years to support the creation and preservation of affordable housing units ( 13 ). Although initial estimates indicated that the fee was expected to collect $3.5 million in 2017, development slowed down and only $800,000 had been collected by the end of the first year – a staggering 78% below projected numbers ( 14 ). Although it is too soon to gauge how the City of Los Angeles’ own linkage fee ordinance will fare, Denver serves as an unfortunate reminder of how well-intentioned housing policies can tragically backfire and stall a city’s housing production and affordability goals. Rent Control: The Costa-Hawkins Rental Housing Act (Costa-Hawkins), established in 1995, placed limitations on locally enacted rent control laws, prohibiting local rent control rules from applying to housing first occupied on or after February 1, 1995 and single-family homes. A December 2017 report from the California Legislative Analyst’s’ Office (LAO) cite several potential negative effects from rent control: conversion of rental housing to ownership housing; reduced turnover amongst renters, resulting in those tenants less likely to move, therefore restricting mobility within the housing market; potentially significant changes in state and local government tax revenues; and reduced property values at and around the vicinity, which can also lead to urban blight. A potential repeal of Costa-Hawkins would be catastrophic to the State’s housing market, first and foremost because rent control does nothing to produce additional housing. In many cases it only incentivizes tenants to stay in one place, choosing artificially cheap housing instead of a new job opportunity in a new location. Because there are no income-based qualifications, in many cases tenants stay in rent-controlled housing even though their income increases substantially over time. This locks others who make much less out of housing opportunities, reserving rent control only for the lucky few. The unintended consequences of a repeal of Costa-Hawkins could lead to economic output losses exceeding $5.7 billion, employment losses exceeding 38,000 jobs, and combined state and local revenue losses of up to $1.3 billion annually due to reduced property values and less construction-related economic activity in the state. Rent control reduces the amount of housing available by constraining new construction. Suspend passage of any additional fees or legislation that increases housing costs or decreases housing production. Enact state and local legislation that streamlines and incentivizes housing production through expanded density bonuses, true expedited permit processing, fast-tracked environmental review, and more local accountability for missing targeted housing goals. Enact policy reforms that encourage the production of workforce housing (120-150% AMI). Developer-Proposed Amenities: community room, public meeting space, public art, teenager activities, rooftop deck, environmentally sustainable. In addition to the above developer-proposed amenities, the City requested parking in excess of the zoning, and robust services for all residents, including car sharing service, child care, retail office space set aside for a nonprofit office, and ground lease for City land. Additionally, the City proposed minimal local jurisdiction investment, and asked for 85% of developer cash flow generated from income after debt. The magnitude of special requests increased construction costs, which, combined with the lack of income potential and city subsidy to pay for these special requests, rendered the project financially infeasible and the project was abandoned. A developer who takes a gamble on this project will not have a financially sustainable model for services, maintenance, and upkeep, which could result in the development quickly becoming a slum. Affordable housing developers already face mountainous challenges, including increased construction costs, increased interest rates, a decrease in subsidized financing, decrease in tax credit pricing, a lack of available land, and community opposition. As this example demonstrates, piling on additional costly and unnecessary requests can kill even a well-designed and well-planned project that would be valuable to the community. 1 Los Angeles Department of City Planning (2016). Annual Element Progress Report. Retrieved from: https://planning.lacity.org/policyinitiatives/Housing/APRs/2016_APR.pdf, page 9. 2 Los Angeles County Department of Regional Planning (2017, March 21). General Plan and Housing Element Progress Reports for 2016. Retrieved from: http://file.lacounty.gov/SDSInter/bos/supdocs/112305.pdf, page 40. 6 Southern California Association of Nonprofit Housing (2017). Los Angeles County Renters in Crisis: A Call to Action, pg. 1. 7 Fermanian Business & Economic Institute at Point Loma Nazarene University. (2015). Opening San Diego’s Door to Lower Housing Costs, pg. 9. 8 California Home Building Foundation. (2017). Impacts of a Prevailing Wage Requirement for Market Rate Housing in California, pg. 3. 9 California Center for Jobs & Economy. (2017). Regulation & Housing: Effects on Housing Supply, Costs and Poverty, pg. 3.